Just a few random things before we close out of this wonderful month. When making torches, don't use socks, sticks and lighter fluid. The socks fall apart. And make sure you read the signs around before making them. My local grocery store gives away all the unsold pumpkins on Halloween night. All you want! 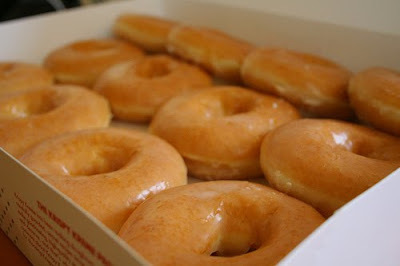 And they sell a dozen glazed donuts for $5.00 because they seem to be a hot commodity. Lesson... donuts are better to buy before hand. Pumpkins... buy a ton the day of and have a carving fest. That is something I should keep in mind for next year. The cold really isn't that bad. Gardner Village the day before Halloween is very crowded, but fun. The witches are so unique, and Keith didn't want to leave. Next year we will go earlier in the month and later in the evening. Simply delightful! now, that's interesting about the socks. I'll have to remember that for next year! And love your pictures. Especially that last one, the coloring is great. What store gives away the free pumpkins? That's good to know for next year!!! Never been to Gardiner Village. We'll have to try it next year! Yum. Those donuts. My fave. I'd personally take cold over heat this time of year. :) Love the photos!! That barn is neat. you guys look like you had a great time--despite socks falling apart,etc--and I could really use a glazed donought right about now. Hm.. I can't say that I've ever tried to make a torch, but now I definitely know not to use socks! Those donuts look quite tasty! Halloween always comes and goes too quickly, doesn't it? As for the torches...I learned long ago it's best to keep me away from anything involving fire. Well nice to know that you had such a wonderful Halloween, we don't celebrate it here. So I had fun learning about it!! Witchy Poo is cracking me up! Looks like you had a smashing time on Halloween, and thanks for the tip about free pumpkins on Halloween day. I wonder if anyone around here does that? If you get a chance today, stop by my blog. I have an award for you! And now I want a donut! !